Support forums » Products » Cute Editor for .NET » Re: Replace Image by double click on the image in the editor. Last post 07-01-2014, 9:22 AM by Kenneth. 19 replies. with following options: undo, Cut, Copy, Paste, Insert etc .. Now when we select 'Insert' option in that sub menu Image option is there. click. Where I can find that click event. I want to fire that 'Image' click event.. Please see the attached file and try to give quick reply.. Please add the code below to the bottom of your page, it will catch this command, and you can achieve your own logic there. Thanks for your valuable reply, the code you provided working fine.The code I put as follows.. I am showing Image Gallery (classic Layout). and click Insert Image option select new image from our Image Gallery (Not Cute Editor's Gallery). Please revert back me as soon as possible..
You can refer to example http://cutesoft.net/example/howto/AddDialogs/cs/create_a_custom_dialog.aspx , it shows you how to replace the selected content from the separate dialog. will double click on that image then one popup will come as below. 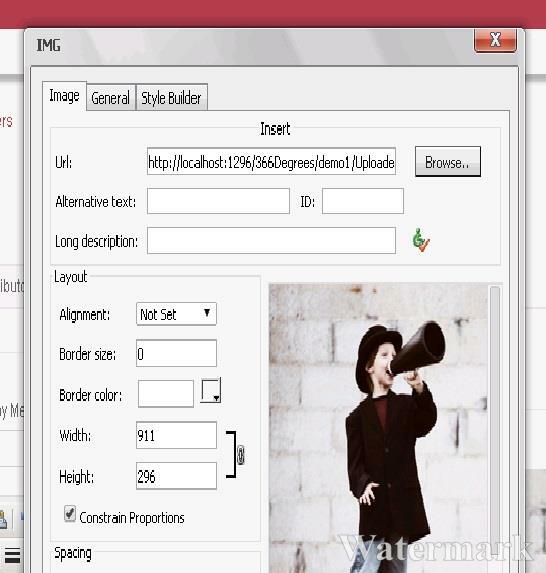 there we can browse Image and place in our editor. double click on the Image (Already selected image) in the Editor I want to show my Image Gallery. Image with the new selected image from my Gallery. Please try to understand and give me quick reply.. I think can not achieve this requirement for now. Replace Image by double click on the image in the editor. 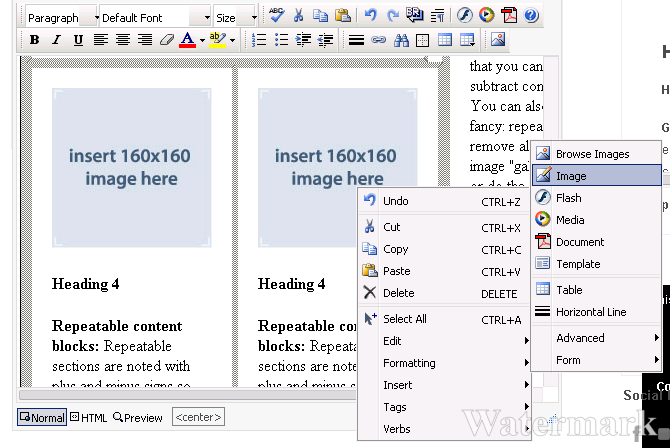 Re: Replace Image by double click on the image in the editor. Can not achieve this requirement for now. Sorry for your inconvenience. In the above Image I want to customize the 'Browse' button. When I double click on Image in the Editor then One Popup will display, In that Popup I want to Customize the 'Browse' button functionality. I want to replace My own Image Gallery on that browse button. How can I acheive it. Please try to give quick reply.. Please open file "\CuteSoft_Client\CuteEditor\Dialogs\Tag\tag_image.ascx" and find section below, that is the browse button, the simple way is that hide this button and create your own button there, so you can achieve any function with the new button. that Gallery. Where I can do all these functionalities. It is a user controller file and these things are not possible in it (ascx file). I mean How I can take my custom browse button (in tag_image.ascx) to my aspx page. How can achieve it. Please Help me.. Thanks in advance..
will be displayed in a button click In that popup our image gallery will be. Ok Leave it. how I can customize Image icon click, Then you gave me code as follows. Like the above code Can I able to customize btnBrowse Click. Please give me solution as early as possible.. It is different, the InsertImage is an editor command, so you can catch it on page, but this browse button just a simple html button. This button click event is encrypted in a js file, so can not customize it. I still do not understand why you need to customzie the button click event, you can simply replace it with your own button, so you can use any code in your own button click event. We cannot achieve this request. It is not easy to integrate asp.net image gallery into RTE. It's better to use the built-in image gallery. Classic Layout). Previously I asked you this question and You gave me the below code. It's worked fine then. But now I checked, it's not working on those clicks I put an alert message, It's not firing. Please provide me updated code.